As a young student of the violin, Joshua Bell learns about an international competition to be held in Kalamazoo, Michigan. He chooses a piece of music, which his teacher suggests may be too difficult, but Joshua is determined. It’s a piece of music he loves. At the competition, Joshua experiences the usual jitters. Once his name is called, he strides to the stage and begins to play, but almost immediately, he makes a mistake. As he is about to walk off the stage, he asks the judges if could try again. They agree, and this time, the playing is impeccable. Dušan Petricic’s brilliant illustrations full of movement and color, capture the sounds made by Joshua’s violin, from the missed notes to the swirling, uplifting strains of the perfectly executed piece. Children will readily empathize with Joshua’s misstep, but they will also learn that there is always a second chance. 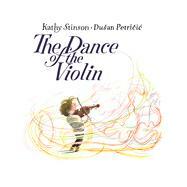 Kathy Stinson is the author of over 25 books for young people, including the beloved, bestselling Red is Best and The Man with the Violin. Dusan Petricic is an editorial cartoonist as well as the award-winning illustrator of such children’s books at Mattland, Bone Button Borscht and The Man with the Violin.